Akit's Complaint Department: SFMTA Plans to Raise Fines for Disabled Parking Abuse - Finally, a GOOD IDEA! 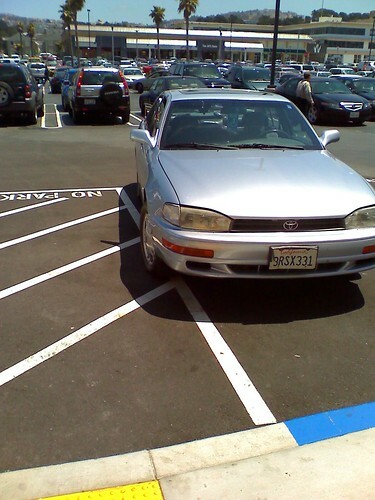 SFMTA Plans to Raise Fines for Disabled Parking Abuse - Finally, a GOOD IDEA! Finally, something the SFMTA Board is going to do right: Raise the fines for disabled parking abuse. No matter if you are disabled or able-bodied, you know how frustrating it is to find a metered parking space; in some areas, disabled placards line-up the entire block. I'm not trying to blame people who have a legitimate disability, just those people who cheat the system with fake placards or borrow a family member's to take advantage of a free parking space or a preferred space. San Francisco plans to raise the fine for fraudulent to $825 (originally $100), however the SFMTA Board can raise it to the new maximum issued by the State of California to $1,000. The fine for parking in a disabled space without the appropriate credentials, and blocking access to the blue zone (including the hash marked zones next to spots) is proposed to be raised to $330 per violation. Also, the new state law can allow cities and towns to permit their parking officers to issue the citations for disabled parking violations. In San Francisco, only the SFPD can issue such citations, however the SFMTA Board must change city policy to allow DPT officers to handle the task. These are excellent ideas for the SFMTA. As we all know, the SFMTA comprises of its two anchor agencies: Muni and DPT. Muni is piss broke, and DPT is well... keeping itself away from the press. By raising fines, this can mean more income for the piss poor SFMTA, but also by confiscating illegal placards, this means more open parking spaces for people to pay the meters (on the flip side, more opportunities for DPT to issue parking tickets for expired meters, two hour zones, etc.). On the negative end, let's hope the DPT doesn't become the bad guys by issuing massive fines for people who actually do have a disability. Not every person has some type of visually obvious disability. Visually seeing if the placard is valid or expired. Inputting the placard or plate's serial number into the database to check legitimacy. Asking the driver and or passenger for the documentation issued by the DMV for the placard or plate. 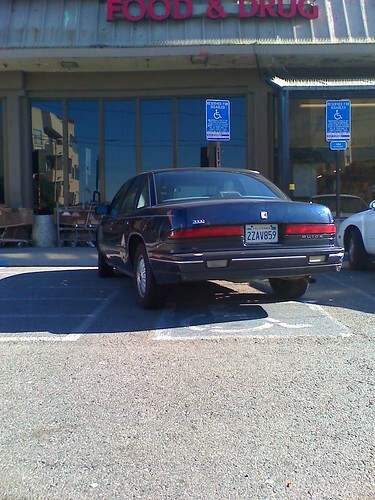 One law I ask the SFMTA or the Board of Supervisors to adjust is the current law that it is illegal to drive with a disabled placard attached to the rear view mirror. The fine needs to be raised. That big plastic tag hanging on the mirror is a big visual block for the driver, especially if the driver is looking for the traffic signal or the stop sign on the right side. Interestingly, when I notice the blue placard on someone's car while they are driving, it's basically a keep away order for me. I've witnessed numerous times of drivers with that placard doing some dangerous driving; in one instance, a driver sped by me at nearly twice the speed limit, cut me off, and made wild lane changes without using the turn signals. See photo. 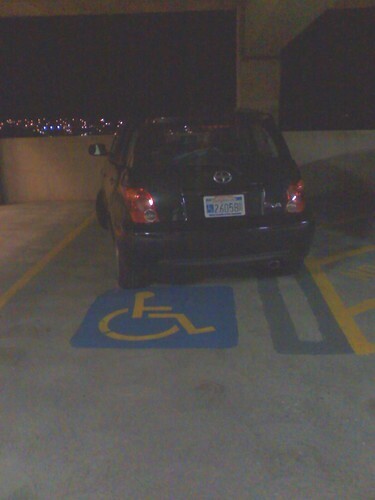 In other situations, I've noticed disabled placard/plated vehicles park their cars inappropriately, such as the photo on the top of this blog posting. One I did not take a photograph of was at Lakeshore Plaza at the USPS drive thru mailboxes and a car with placard parked in the drive thru so that she can pick-up a passenger several minutes later and I was honking my horn and cursing. just so you know, sometimes disabled persons will park further into the parking spot if they have to remove items from their trunk, or they need to move their walking assistance devices out of the trunk. this is because if you have a normal unmodified car to carry your walking assistance device, the cross hatched area to the side of every disabled parking spot for loading and unloading is useless. so, to avoid being hit by other drivers who may not be able to see you at a lowered height level (either in a wheelchair, or some other device that lowers you from a "normal" height) disabled persons will pull further into the spot to use the trunk/etc. otherwise the disabled person might end up getting hit by another unwary driver because they are sticking out past the end of the parking spot, and are not able to be seen being of lowered height. one solution for this would be to allow handicapped persons to park either way in the parking spot, either normally pull in and use the cross hatched sideloader area, or pull in sideways (ie park parallel) and use the end of the cross hatched sideloader area to unload from the trunk. but i am not sure how this would actually work out, i think even with the sideloader areas it would still be somewhat less in length than a standard parking area. Im gonna go on ahead and say that Im tired of "disabled" people getting benefits. You want to drive, well then you MUST have a license plate on your car with a disabled logo. If you have more then one car in your name, financing option, or address, then only ONE car gets the special plate. Additionally, handicapt or not, EVERYONE pays at the meter. There should be ONE handicapt BLUE spot on the street per every 2 BLOCKS (not required) where disabled people can park for free. If its occupied, then I guess they have to pay for the next best spot. Parking in cross hatch zones will result in a $100 fine (handicapt or not), in addition to this, the cross hatch zone WILL be smaller, but handicapt parking space will be WIDER and DEEPER for the accommodation of the vehicles disabled persons might use. If I have to pay because I can walk, then they have to pay because they can drive!